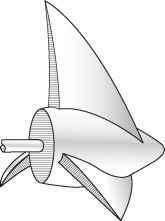 Figure 8.3 Hydropower turbines: (a) Pelton (b) Francis and (c) propeller turbines efficiently. 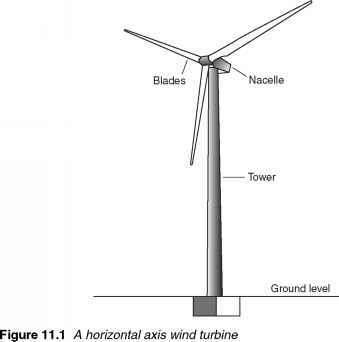 And whereas the impulse turbine harnesses the kinetic contained in a jet of high-pressure water, a reaction turbine responds to the pressure (potential energy) from the weight of water acting on one side of its blades. There are several different types of reaction turbine. The most popular, accounting for 80% of all hydraulic turbines in operation, is the Francis turbine. 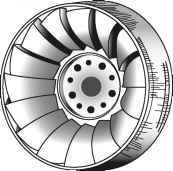 This can be used in almost every situation but for very low heads, propeller turbines and Kaplan turbines are frequently preferred. The Francis turbine was developed by James Bichens Francis around 1855. Its key characteristic is the fact that water changes direction as it passes through the turbine. The flow enters the turbine in a radial direction, flowing towards its axis, but it exits along the direction of that axis. 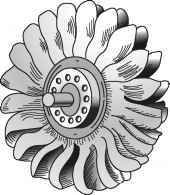 It is for this reason that the Francis turbine is sometimes called a mixed-flow turbine. The blades of a Francis turbine are carefully shaped to extract the maximum amount of energy from the water flowing through it. Water should flow smoothly through the turbine for best efficiency. The force exerted by the water on the blades causes the turbine to spin and the rotation is converted into electricity by a generator. Blade shape is determined by the height of the water head available and the flow volume. 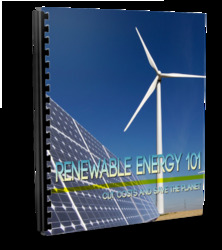 Each turbine is designed for a specific set of conditions experienced at a particular site. When well designed, a Francis turbine can capture 90-95% of the energy in the water. Francis turbines are the heavyweights of the turbine world. The largest, at the Itaipu power plant on the Brazil-Paraguay border, generate 740 MW each from a head of 120 m.
The Francis design has been used with head heights of from 3 to 600 m but it delivers its best performance between 100 and 300 m. Impulse turbines are often preferred for higher heads while lower heads are exploited using propeller and Kaplan turbines.